Louis E. Funderburg, 94, of Mineral Springs, Ark., passed away on Wednesday, Jan. 23, 2019 in Nashville, Ark. He was born on March 15, 1924 in Buck Range, Ark., the son of the late John and Beulah Blackwood Funderburg. Mr. Funderburg was a member of the Central Baptist Church in Mineral Springs; a mason for 60 years; he was employed for 38 years with Southwestern Telephone; a former president of the AT&T Pioneers Club; and served in the United States Navy. He was preceded in death by his wife of 66 years, Judy Underwood Funderburg. Survivors include: two sons, Gene Funderburg and wife Jackie of Mineral Springs, Ark., and Ken Funderburg and wife Luella of Carrolton, Texas; one daughter Becky Hunnicutt and husband Bruce of Mount Vernon, Texas; eight grandchildren, Jeri Liedl and husband Joe, Jami Braxton and husband Leonard, Brian Hunnicutt and wife Lindsey, Lisa Garrard and husband Grant, Nicole Rynders and husband Josh, Bonne Brumitt and husband Matt, Brady Hunnicutt and wife Sarah, Baily Matej and husband Andrew; 11 great-grandchildren, Chandler Funderburg, Aina Carlson, Emily Carlson, Lindsay Moon and Brandon, Annaka Thompson, Leni Braxton, Landri Braxton, Dylan Hunnicutt, Gavyn Hunnicutt, Hank Hunnicutt, Troy Hunnicutt, and a host of family and friends. Visitation was 12:30 until service time, Sunday, Jan. 27, 2019, at Latimer Funeral Home in Nashville. Services were at 2 p.m., Sunday, Jan. 27, at Latimer Funeral Home in Nashville, with Bro. Ben Jones and Bro. David Blase officiating. 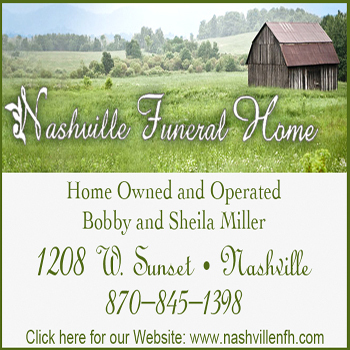 Burial followed in Liberty Cemetery, under the direction of Latimer Funeral Home in Nashville. You may send an online sympathy message at www.latimerfuneralhome.com.